If you are planning to celebrate the New Year in the Southeast, it is most likely that you will be offered black-eyed peas in some form, either just after midnight or on New Year's Day. From gala gourmet dinners to small casual gatherings with friends and family, these flavorful legumes are traditionally, according to Southern folklore, the first food to be eaten on New Year's Day for luck and prosperity throughout the year ahead. Why Are Black Eyed Peas Good Luck? 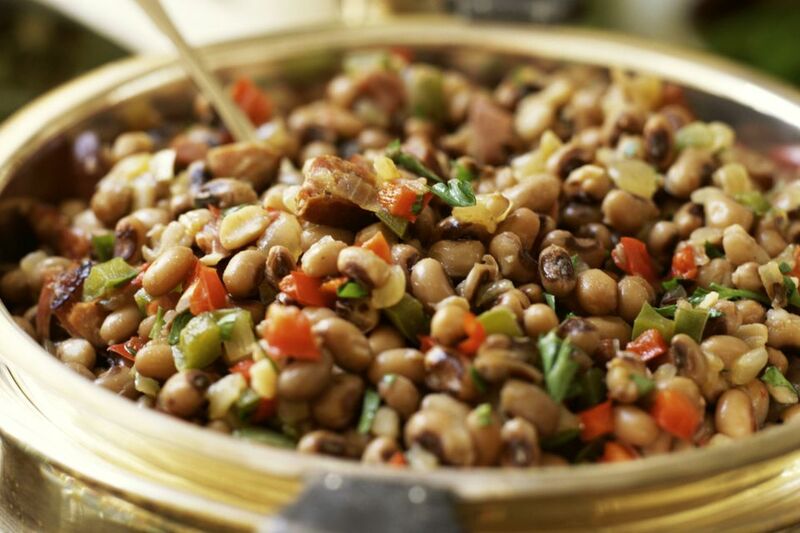 The practice of eating black-eyed peas for luck is generally believed to date back to the Civil War. At first, planted as food for livestock, and later a food staple for slaves in the South, the fields of black-eyed peas were ignored as Sherman's troops destroyed or stole other crops, thereby giving the humble, but nourishing, black-eyed pea an important role as a major food source for surviving Confederates. What Does Tradition Say You Should Eat With Black Eyed Peas? Served with greens (collards, mustard or turnip greens, which varies regionally), the peas represent coins and the greens represent paper money. In some areas, cabbage is used in place of the greens. For the best chance of luck every day in the year ahead, one must eat at least 365 black-eyed peas on New Year's Day. Hoppin' John - Although served throughout the year as well, Hoppin' John is one of the most traditional New Year's Eve and New Year's Day dishes in the South. Black-eyed peas are cooked with rice, pork (such as chopped pork or ham, hog jowls or hambones, fatback or bacon) and seasonings. Sometimes chopped onions and hot sauce are added. Texas (Black-Eyed Pea) Caviar - This is a popular casual alternative that blends Southern and Mexican flavors with black-eyed peas and is usually served with tortilla chips. Black-Eyed Pea Salad - There are many recipes for salads made with black-eyed peas, a good choice for a side dish served with other dishes. One version is made with cider vinegar and basil dressing. How Do You Cook Dried Black-Eyed Peas? Cooking faster than many other dried bean varieties, black-eyed peas need a good rinse and then are brought to a boil and turned down to simmer until tender. A pound of peas will need to simmer, with your seasoning of choice, approximately 45 minutes to an hour to reach desired tenderness. For the low and slow approach, a slow cooker can be used on low to cook the beans for 6-8 hours. What Type of Seasoning is Used For Black-Eyed Peas? Seasoning varies with the cook. Often onions, garlic, celery are sauteed together to be added to the simmering black-eyed peas. Meat such as bacon and ham hocks are popular additions as well. A more simplistic approach of salt and pepper seasoning is widely accepted as well. Don't forget to put your hot sauce of choice on the table—many black-eyed pea aficionados like to spice them up. What are Black-Eyed Peas: a Bean or Pea? Black-eyed peas are actually not peas at all, but rather a variety of bean related to the cowpea and categorized as legumes, having both edible seeds and pods. According to the Library of Congress, they have been cultivated in China and India since prehistoric times and were eaten by the ancient Greeks and Romans. Early records from 1674 indicate that black-eyed peas were transported from West Africa to the West Indies by slaves. Subsequently, they reached the Lowcountry coastal regions of the Carolinas and Georgia, also via enslaved Africans, more than 300 years ago. Whether you choose to follow the Southern New Year's tradition or not, black-eyed peas are a good source of nutrition. According to the U.S. Department of Agriculture, black-eyed peas are low in fat, contain no cholesterol, and are low in sodium. They are high in potassium, iron, and fiber and a one-half cup serving of cooked black-eyed peas counts as one ounce of lean meat from the Meat, Poultry, Fish, Dry Beans, Eggs and Nuts Group of the Food Guide Pyramid.